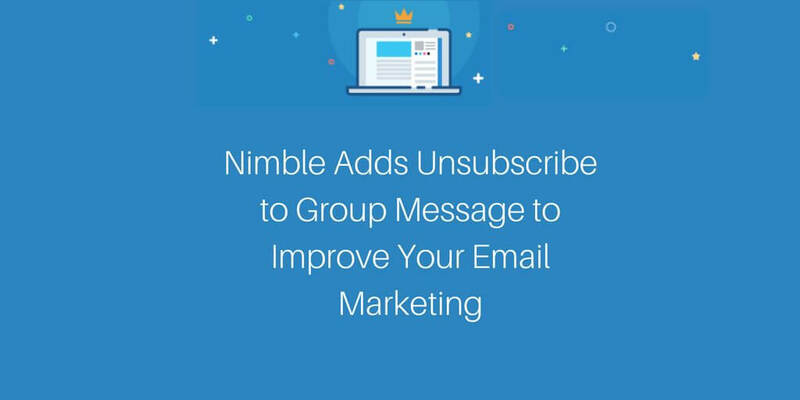 We’re excited to announce that we’ve added an all-new “unsubscribe” button to Group Messages for Nimble. 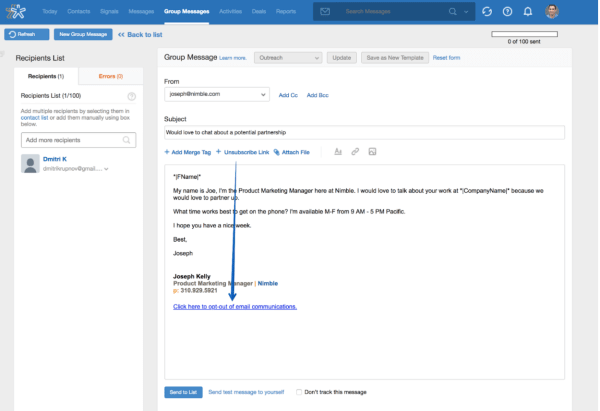 Now, you have the option to include an opt-out link in all of your cold email outreach and newsletters sent via Nimble. How does the unsubscribe function work? When emailing to a list via Group Messages, you’ll now have the ability to insert an “unsubscribe” link tag into your email. As a best practice, we recommend clearly labeling the unsubscribe link in your email footer (usually below your signature). When a recipient of a message sent via Group Messages clicks on this link, they’ll immediately be unsubscribed from receiving your bulk messages. Note, this will not prevent you from sending direct one-to-one emails to a contact in your Nimble account, but it will prevent you from sending a message via the Group Messages tab. You can review your list of unsubscribed contacts by going to your Email Settings, or you can move contacts to your whitelist. When Is It Appropriate to Use Nimble’s Unsubscribe Button? For any bulk email outreach, it’s best practice to give your recipients the ability to opt-out. With GDPR and CAN-SPAM, an opt-out is required to be included in all of your unsolicited email outreach. Our general rule of thumb is: if you are sending any email in which the primary purpose is the commercial advertisement, or promotion of a product or service, you ought to include an unsubscribe option. What If I’m Not Sure Where to Get Started? If you’re new to Group Messages with Nimble, start here and then check these article to learn the basics – Everything You Need to Send Successful Email Outreach With Nimble Group Messaging and 4 Steps to Turning Cold Emails into Warm Emails. Once you’re caught up to speed on the basics of successful email outreach, check out our FAQ on setting up unsubscribes in Nimble. The “unsubscribe” feature for Group Messaging is available to Nimble Business plans at no additional cost. Don’t have an account? 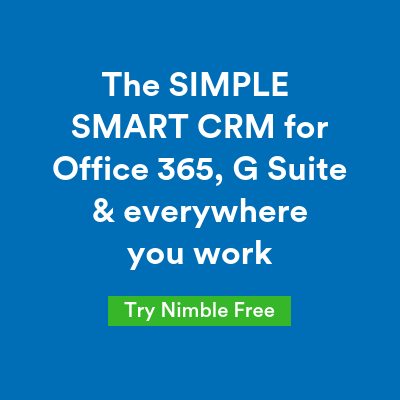 Connect all your contacts from 100+ SaaS apps by trying Nimble today!